Temperature sensors provide an input to a system (indicator, controller or other device) that is used to determine the temperature of a specific process or location. This requires that the sensor is connected to the instrument so that the signal can be received. This connection can be made via an extended length cable from the sensor that is hard-wired directly to the instrument, an extension cable connected to the sensor at its point of use, or by transmission via a wireless network. Sensors with extended length cables work well unless the sensor needs to be replaced or removed for calibration or maintenance. When this occurs, often times the cable needs to be removed from a cable tray or cable bundle for a considerable distance, resulting in lost time, cost and aggravation. The use of extension cables connected to the sensor at their point of use eliminates all of that lost time and aggravation since the sensor can simply be disconnected and removed. Wireless networks can be great, but they are not always the best selection depending on the application and location. The development and release of IEC Standard 61076-2-101, “Connectors for Electronic Equipment” opened the door for a connection system that is reliable, reasonably priced, and readily available. That connector, often referred to as an “M12” connector, is now a staple in many sensing and control applications. Omega Engineering is leading the way in adapting this connector system to a variety of temperature sensor products including Thermocouples, Resistance Temperature Detectors (RTDs) and Thermistor sensors. These sensors are being used in a growing number of applications including food and dairy processing, biopharmaceuticals and industrial automation. Standard convention is to place the connector with exposed pins (see Figure 3) on the non-powered (sensor) side of the connection so that any unintended contact with the operating current will not occur. For this reason, Omega’s temperature sensor products all include a “plug” style connector on the product as shown in Figure 3. The extension cable, which connects the sensor to the system, provides the operating current and returns the sensor’s signal, has a socket style connector (see Figure 4). This connector can be a molded connector or one that is mechanically assembled. 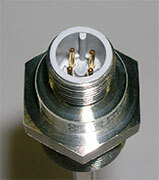 Figure 4 shows a typical mechanically mounted socket style connector. In addition to the ease of installation and maintenance, M12 connections provide the additional benefit of providing sealed connections that can be used in wet or wash down environments. Processes such as those used in the food, dairy and pharmaceutical industries are exposed to frequent wash downs where the M12 connection protects the wire connections from attack and corrosion by the chemicals used in these processes. M12 connectors are available in a variety of configurations. Omega has adopted the commonly used “A-coded”, 4-pin connector style (see Figure 5) for all of our sensors. This arrangement provides the greatest flexibility for the customers since all of our M12 enabled RTD sensors are made with 4-wire construction (so they can be used with any 2, 3 or 4-wire system) and thermocouples can be made with single or dual junctions. Omega Engineering’s family of M12 enabled sensor products are offered with machined stainless steel or injection molded housings. Machined stainless steel housings can be supplied with a variety of mounting threads or with non-threaded housings to suit the application. Omega also supplies a line of 3A approved tri-grip sensors that can be used in Clean-In-Place (CIP) systems typically used in food, dairy, fermentation and pharmaceutical industries. Omega’s growing family of M12 enabled sensors includes all of the common styles of temperature sensors including RTDs, Thermocouples and Thermistor sensors. 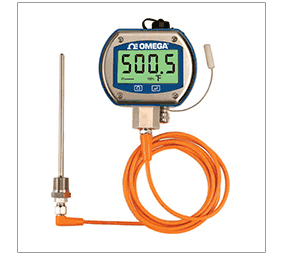 Keeping with Omega’s emphasis on providing measurement solutions to meet nearly any customer application, we offer a wide selection of M12 extension cables and accessories. These include the typical PVC and Polyurethane cables, as well as a new line of fully compensated thermocouple cables. A typical PVC insulated cable with over molded connectors is shown in Figure 6. In order to provide a completely customizable line of extension cables, Omega also offers extension cables utilizing mechanically assembled connectors to which we can attach a wide variety of cable constructions, as well as enhancements such as steel over-braid and square locked hose for improved mechanical protection or electrical shielding (see Figure 7).